Last weekend was the fifth Green End heaviest marrow competition, AW and family have been cosseting their plants through all the stormy weather. 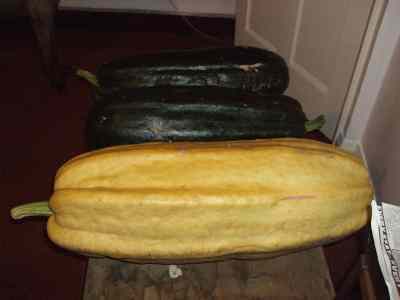 On Saturday morning the largest were chosen from their respective plants, cut, washed and carefully polished; Mr W's marrow was so large it had to go in the car, normally a wheelbarrow suffices! AW's offering came fourth but Mr W's was so large it didn't fit on the scales and had to be hung from a spring balance. It came in at 36¾lbs, yes that's right 2 and half stone of marrow. Not quite half ton veg but almost. Needless to say it was the winner and they went proudly home with their trophy and are now working out what to do with several stone of marrow. The monster yellow fellow is the winning cucurbit. And through all the excitement of birds (see yesterday's posting) and marrow competitions CJS rumbles on and the weekly is now thundering off the printers. It's another small one this week at 8 sides with 70 new paid posts (25 direct to CJS). There's also a call for participants for a new BBC competition to win a year's contact at the prestigious Natural History Unit in Bristol. More Birds and a Weekly. The CJS Garden bird watch has started.